What purpose does a flash game serve? Something to kill a few minutes while you decide if you should stay at work or go home early? Sounds about right. Flash games rather than their full on, disc-based counter-parts are able to rely on only one or two types of gameplay gimmicks without getting too repetitive. In indie game developer Matt Thorson’s latest release, Give Up, Robot, these objectives are met and used to their fullest. Give Up, Robot has quite the simple premise: You are a robot with a grappling hook ala Bionic Commando and an all-encompassing desire to jump and swing your way to the next level. Following you throughout the game is the antagonizing, disembodied voice of another robot that wishes you to fail. While that may sound a bit disheartening, the voice is generally pretty funny and even when you start dying over and over again, is easy to tune out. The level design of Give Up, Robot is smart and intuitive. 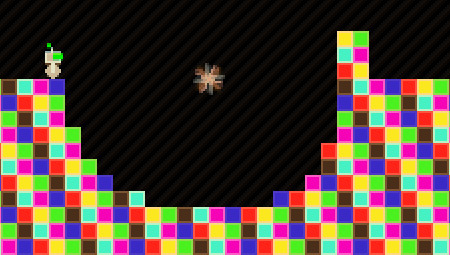 The gameplay consists of fast-paced, one-off levels that throw some new mechanic or small puzzle at you. They start quite simple, but soon can be pretty frustrating. Since each level is mainly one jump or one quick sequence though, and you have infinite lives, it’s easy to keep trying without throwing the keyboard against the wall. 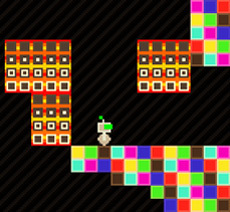 The look of each level, with bright flashing colors is like playing through a discotheque made out of Rubik’s cubes. Since the game is meant to be played in quick doses the heavy color saturation makes it punchy and fun. Playing for extended periods though, can end up getting a little tiring to watch. The music lends itself well to the concept of the game with fun, techno beats throughout. Overall, an enjoyable experience, brain and eye candy operating near the highest levels of a flash game. Cool game…. you gotta hand it to Matt that he can develop a game like this using only free software/tools. He is a very creative guy.